This portion of the post is sponsored by Health Warrior. Like most of you, I do not have time for a long list of 8 million things to do in the morning. I don’t get up until Brady does (sleep is life), so once we’re up at the same time, we have to get the day started smoothly together. I’m a creature of habit and have created a little system that works for us. (1) Chug water by the bed. I keep a big glass of water by the bed, so I can do a quick chug first thing, without even having to go fill up my cup — gotta start the hydration process right off the bat. I feel like this act of drinking right away gives me a little burst of energy too. Also, I tend to think that you can’t make decisions when you’re dehydrated, which will ultimately slow you down in the morning, so drink up. (3) Don’t get sidetracked by technology before breakfast. I do NOT open my phone and start scrolling first thing in the morning, letting my day get started on the wrong foot and throwing me off track. My hard-and-fast rule is that I get both Brady and me situated with our breakfasts before opening my computer — from there I check emails to see if there’s anything important for a few minutes while I eat. I don’t even check my phone or open Instagram or Facebook until a bit later in the morning once we’re on the move, so I don’t waste any time there. (4) Check the written plan for the day. Every night, I write down the things I need to get done the next day in my notebook, in a pseudo-bullet journal fashion. And that includes what my workout will be, which dictates what time we head to the gym. Once Brady and I are having breakfast, I will do a quick check of what’s in store for the day, and on most days, we head to the gym for a workout class to get going by 9:30 a.m. or so. Although I do teach my own group fitness classes in the afternoon three days a week, during the other days, I like to get my workout in on the earlier side. There are so many benefits to being a morning exerciser, and I definitely think it gives me more pep in my step the rest of the day. (5) Do the most important stuff first. Once breakfast is cleaned up, we’ve got our plan for the day, we get dressed and get going on to the first activity. If there’s an important errand, we’ll hit that up first (or right after the gym), so it doesn’t get missed. What’s that saying? Eat the biggest frog first? You know what I mean. And those are a few of the things that help make the morning go well for us right now (outside of any toddler tantrums, of course). 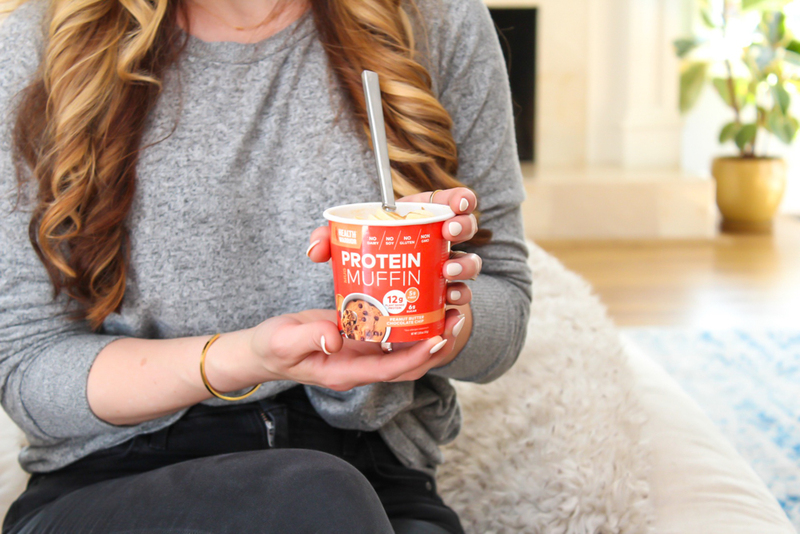 Now, more about the new Health Warrior protein mug muffins. They each have 12 grams of plant-based protein; they do not have dairy, nor soy; and they are gluten free and non-GMO. They contain 5 grams of fiber, and they are made from superfoods like almonds, sorghum, pumpkin seeds and flax seeds. The available flavors include: blueberry, banana nut and peanut butter chocolate chip. All are good, but I think the PB one is my fave. These muffins are available for sale on the Health Warrior site and you can also find them on Amazon or at Wegmans on the East Coast. TWO lucky readers will each win a 12-pack sampler box of Health Warrior protein mug muffins of various flavors. You must reside in the U.S. and you MUST be following both A Lady Goes West and Health Warrior on Instagram to win. This giveaway will close on Wednesday, April 17. Good luck! To enter: Leave a comment on this blog post. See the questions at the end of the post! Thanks to Health Warrior for partnering on this mention. I received product and compensation, but all thoughts are my own. Three cheers for healthy food companies. If you order something from Beautycounter and don’t like it, send it back within 60 days and get your money back, minus shipping. Everything is cruelty free, nontoxic and safe for pregnant and nursing women (not a lot of other skincare brands can say that). More than 130 items are 15 percent off right now until Monday. This kind of deal only comes around maybe once a year outside of Black Friday. You can start out by taking this skincare quiz. 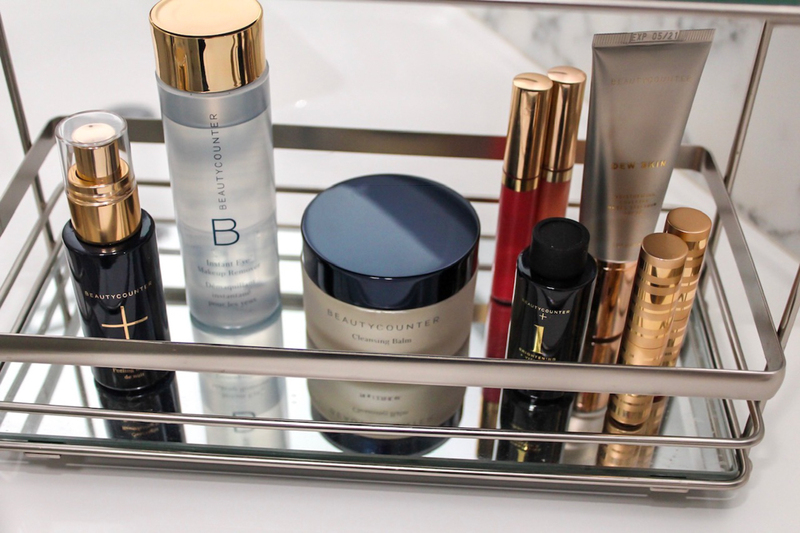 You can sign up for my Beautycounter emails if you want to know more. 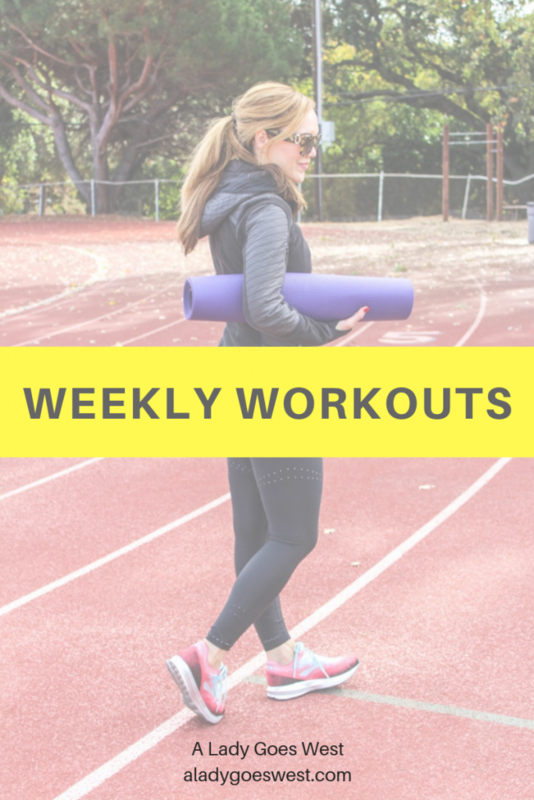 Wednesday: 20 minutes of BODYPUMP, 12 p.m., taught 1-hour barre class, 5 p.m.
Thursday: 45-minute gentle yoga class, 11 a.m.
Friday: 50 minutes of BODYPUMP, 11 a.m.
Saturday: 30 minutes of BODYATTACK, 9:30 a.m.
Sunday: Taught 1-hour BODYPUMP class, 8:30 a.m. This past week had a lot of workouts! I subbed two classes, but also got a sub for one of my usual classes so I could go to an event in Sonoma. My rest day was actually an active recovery day with nothing but a gentle yoga flow. And even though I didn’t do a solo weights session, I picked up a barbell quite a few times to take, practice and teach BODYPUMP. All good here. Yoga for the feet. This an excellent list of stretches for the feet. In fact, I think I’ll go do them now. Thanks for sharing this one, Beth. Spring clean the kitchen. A few simple tips for cleaning up your kitchen for your health this season. Carbonated water. Ever wonder if carbonated water is bad for you? I have! This article tells you if that’s the case and what you should look out for. 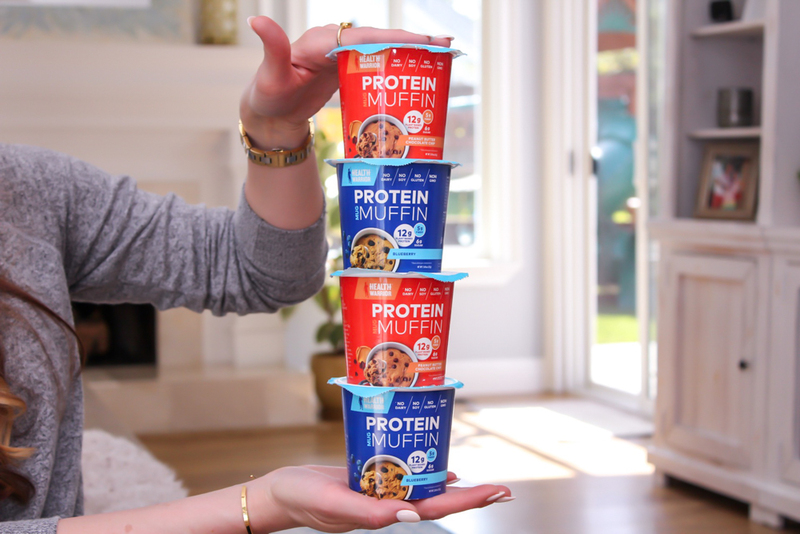 GIVEAWAY: Make sure you leave a comment below to be entered to win the Health Warrior protein mug muffins. When you leave a comment, your email address will not be posted publicly, by the way, just your comment. Good luck! Which Health Warrior product would you most like to try? Check out the line-up here. What’s the best thing that happened during your week? This weekend I am cleaning out closets. I am interested in trying the Coconut Chia Bars. My April goal is to laugh more. Anne! Laughing is good for the soul — I hope you’re able to do it! And good luck cleaning out your closet — I’m due for a purge as well. Have a great weekend! This weekend, I’m taking my kids to an Easter egg hunt! I would love to try the protein mug muffin!!! Looks so good!!! And for April, I’m trying to slow down and become more intune with my body! Ahhh we said we’d make it to Tahoe to ski this season — alas we didn’t make it again ahaah. Hope you have a WONDERFUL time, Sheila! What a great workout skiing must be too. The Peanut Butter Chocolate Chip muffins are something I’d like to try. I’m looking forward to time with my two little boys, 1 and 3. 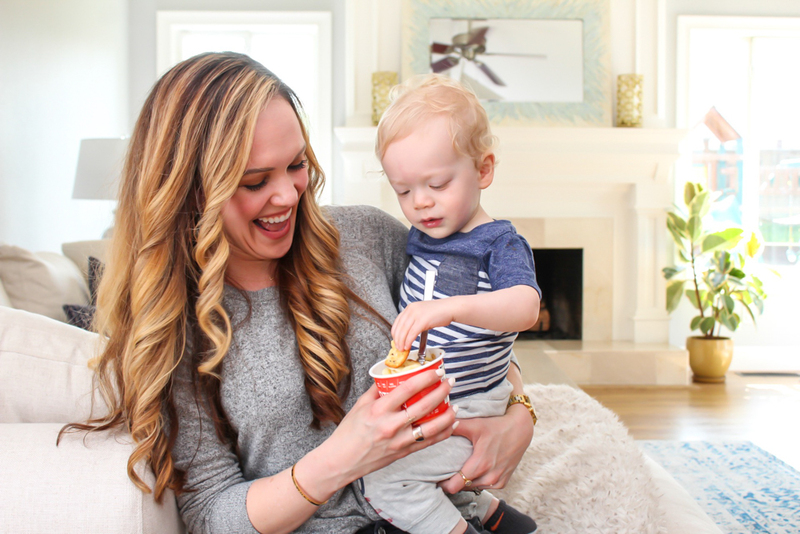 I would love to try the Peanut Butter Chocolate Chip flavor, as I know my toddlers would love it too! Big PB and chocolate fans over here! This weekend I am teaching some Pilates and barre classes and then heading out for a work trip on Sunday. I’m a sucker for anything peanut butter and chocolate so I would love to try the protein muffin! 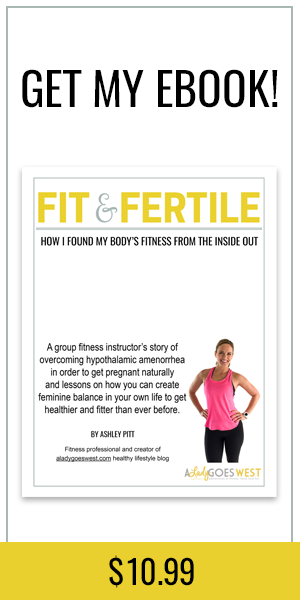 I teach at a boutique fitness studio in Santa Barbara, CA. We do everything from reformer to spinning, TRX, barre, etc. If you are ever in the area come check us out at Core Sport! I would love to try out Health Warrior protein muffins! I’m always trying to find more options based on my dietary restrictions and these fit the bill for when I don’t have time to meal prep! The best thing that happened to me this week was an unexpected dinner with my son. He’s a busy high school senior during soccer season, so meals with him are few and far between right now, and so when practice was cancelled and the girlfriend was out of town, it meant home for dinner…and I loved it. My weekend plans include pulling out old photo albums to find pictures of this young man to use on his photo boards during his grad party. Enjoy these busy, hectic days with your little guy, because you will blink and suddenly he’ll be graduating! Hi Faith! Oh my goodness — what a treat to have dinner with your son — I can’t imagine Brady being busy and having his own life heehe — but clearly that will happen one day. Also, I remember grad boards! 🙂 Enjoy your weekend so much! That’s a very festive weekend, Latanya! Have fun! I have a hard time eating enough protein – so I would love to try any of the Health Warrior products. Thank you. This weekend includes massages and brunch for a friend’s 30th! My main goal for April is to finish out the end of the semester for the two grad classes I’m taking. One more class in the summer and then I’ll be done the program, can’t wait! Hi Ashley! That sounds like an awesome day!! 🙂 And good luck finishing up your grad program – what are you studying? The ccpb mug muffin looks good. I’ll have to look for that brand at the grocery and see if they carry it. Goal for April is to learn to use my new ab wheel – building back core strength. Hi Stefanie! An ab wheel? That’s fun! Good luck with that!! 🙂 Happy Friday! We have a busy weekend; swim lessons for my 4 year old, our weekly target trip, church on Sunday, and a birthday party. I would LOVE to try the protein muffins; it sounds like a great quick breakfast that could be eaten with one hand while my 4 week old is in the other! First of all, I’m a fan! I think your great. Love your blog and your just simply inspiring. So Thank YOU! Health Warrior muffins would be such a hit in my household that I would love to/just need to, try all the flavors. As for weekend plans…we have nothing exciting “planned” just our usual morning workouts, Sunday brunch, catching up on house work, meal prepping, DVR, yard work, blog reading etc…. Hi Stephanie, You are SO sweet and your nice comment has made my day. I truly appreciate you reading and hanging out here. 🙂 As far as the muffins – YES, we’re all eating them in my house too. And for the weekend, having nothing “planned” is such a treat hehehe — enjoy it all! Happy Friday! I only have one goal for April: run the strongest Nashville marathon to date!! Also, I miss teaching fitness classes!! Unfortunately, we do not have affordable daycare options or a gym that has childcare with fitness instructor positions open! Bummer. I am with you on starting tech free!! I do however wake up before my little one because I NEED that solo coffee hour before the day!! But, I am also with my little one 24/7 so that time is like gold. oh and I like the idea of chocolate pb chia!! Hi Jess! Sorry to hear the gym options are lacking — maybe you should start a Baby Boot Camp or Stroller Strides in your area or open a gym?? Go for it! hehehe That’s awesome you have the solo morning time, I LOVE my sleep too much, but I do enjoy the days I’m up before Brady. Gotta do what works!! Have a great weekend! I’ve been dying to try those muffins! This weekend we will probably spend some time at the gym and some time at the beach. Other than that, the usual weekend errands. I’d love to try the Health Warrior protein muffins! We’re playing golf and catching up on Netflix shows this weekend! Hi Tracy! Sounds like Dave’s dream weekend — golf and Netflix!! Have so much fun! This weekend includes lots of family time (which mostly entails trying to keep our VERY active 3 year old son entertained!) and a fun date night to celebrate our sixth wedding anniversary! I’m most excited to try the pb chocolate chip muffin! Thanks for hosting the giveaway! Have a great weekend with your family! Hi Amanda! Oh yay for six years — have a wonderful date night and happy wedding anniversary! I think a nap is on the schedule for this weekend! The pb chocolate chip muffin sounds great. Hope you have a great weekend! Enjoy your nap, Jennifer!! 🙂 YAY! I also have to write down my schedule for the next day every night. Otherwise, I would be going through everything in my head over and over again. And it feels so good to cross things off! Good work, Brittany! It feels good to have everything written down! 🙂 Hope your weekend is great! I’m doing a 5K run on Saturday and brunch with my Mom on Sunday for my weekend. These muffins look amazing! Have fun during your run, Renata! Thanks for saying hi! After working non stop the last few weeks, including last weekend, I’m excited to have some family time this weekend-including decorating Easter cookies with my 4 year old! Ohhhh that sounds like a messy and great time, Amy. Enjoy your weekend off! Hi Liz! Wow that’s early! My earliest class was at 5:45 a.m. back in Orlando, and that seemed SO much worse than the 6 a.m.s I did for a long time after that hehe! 🙂 You are a hero and your members must appreciate you so much. We are just hanging out and watching the Master’s! Hoping to be a winner of the muffins 🤞🏻 YAY!!!! Protein muffins sound delicious and would make a nutritious breakfast too. Thank you! I’d love to try the protein muffins! 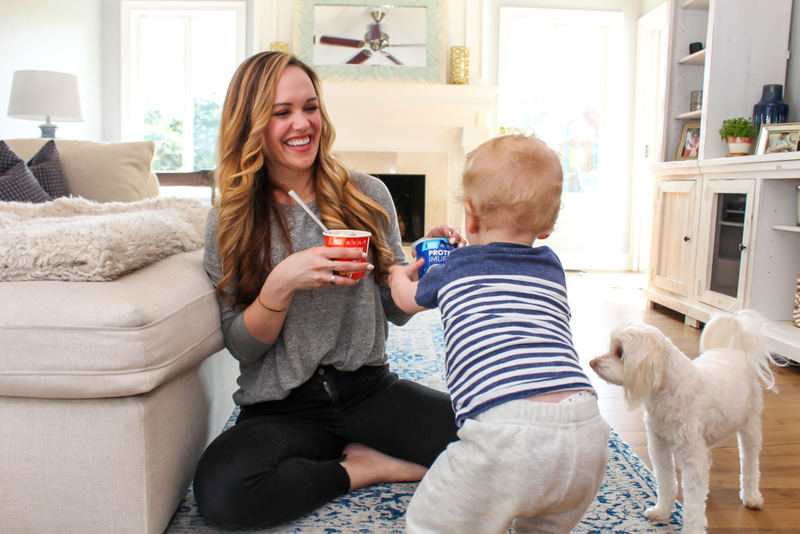 I’m a new mama and always looking for quick, nutritious foods to grab while caring for my 11 week old baby. Best thing that happened this week – we got another glimpse of our baby boy at our 32 week appointment! So thankful for a healthy, growing babe! We did some spring power washing of the exterior house and driveway/walkways, and my plans for April include getting seeds started for my veggie garden. The Organic Dark Chocolate Pumpkin Seed Bars from Health Warrior look delicious! Headed to denver to see a girlfriend this weekend! Fingers crossed the weather doesn’t keep us indoors. I love the flap jacked protein muffins you microwave but I’ve never seen the health warrior ones in a store before, I would love to try them.